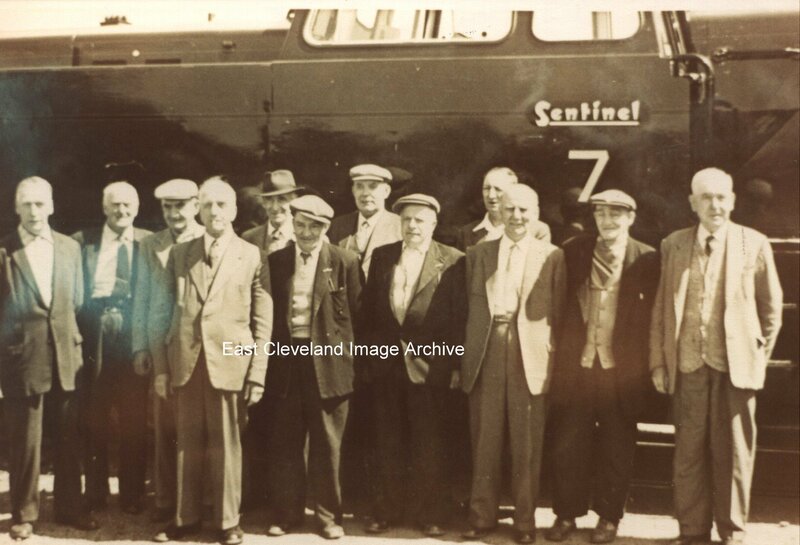 Skinningrove Works Pensioners on a sight-seeing tour of the new Sentinel locomotives in 1963; the Archive didn’t know whether they were retired loco men though. Derick Pearson seems to remember the colour scheme was a rather dark; possibly racing green. Assembled in front of the Sentinel locomotive (left to right): ??, ? ?, ??, ? ?, Eric Hatfield (from Brotton), Sam Thackery, Frank Simonds, ??, ? ?, ??, ? ?, Mr J Husband. Thanks to Derick Pearson, Philip Saunby, Terry Robinson, Alan Pearson and A. N. Andre for the update and names.